Los Angeles’ leading data center and hosting provider expands service offerings with the opening of their premium Secaucus, New Jersey, USA facility. “We have set a precedent of offering our global clientele service without sacrifice and this new facility delivers these expectations flawlessly.” - Dustin B. Cisneros, Global Sales Manager, QuadraNet, Inc.
QuadraNet Inc. has expanded their strategic list of data center locations and is now providing services to their clients out of their new 48,000 square foot facility located at 110 Meadowlands Parkway Suite 100, Secaucus, New Jersey, 07094. This newest facility of theirs is conveniently located in the heart of Secaucus, New Jersey, less than an hour from New York, and is easily accessible from Newark Liberty International Airport, New York City, and Philadelphia. The data center offers conditioned raised-floor space that is capable of providing a 100% power uptime service level guarantee to businesses with atypically high-density critical loads and even the most stringent redundancy requirements. With an extensive host of carrier options on-net, utilizing this facility will provide low-latency routes across the United States, as well as optimised routes to mid-Atlantic regions, Canada, and Europe. With the opening of this new data center, QuadraNet will be able to offer increased flexibility to clients requiring unique space and power requirements at unparalleled values in the New York and East Coast marketplace. QuadraNet Inc., since 2001, has been a leader in hosting and data center solutions as a telecommunications provider in Los Angeles and the surrounding areas. 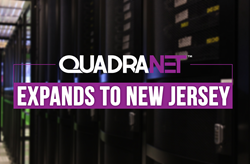 QuadraNet has grown to become one of the largest providers of dedicated servers, colocation, cloud hosting, and bandwidth services. In additional to Los Angeles, QuadraNet has expanded to offer services in Dallas, TX, Miami, FL, Atlanta, GA, and Secaucus, New Jersey. With a team of highly-skilled professionals that are passionate and excel at designing and implementing the perfect solution for clients and their businesses, QuadraNet has a chief focus on providing consistent and exceptional service and support. Facilities and services are staff and monitored 24×7 to assist with everything from routine memory upgrades to advanced systems troubleshooting.